Wonder Woman: Legacy was written to help fight breast cancer and perhaps give Wonder Woman her greatest challenge. Wonder Woman has a secret -- a sixteen year old daughter. Well educated and rigorously trained by Amazon instructors and her mother, Elissa is the smallest of her people and has only a fraction of her mother's power. Desperate for her mother's elusive approval, Elissa takes the garb of Wonder Woman and one of Themyscira's most advanced jets and runs away from home to assume her mother's role as Wonder Woman, and hopefully return home a hero and prove she is all Amazon. 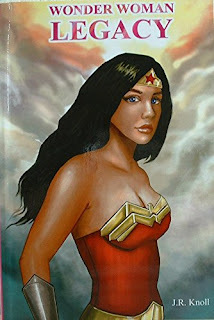 However, things in Patriarch's World are not as simple as she had hoped and an encounter with one of her mother's most powerful enemies makes her realize how truly unprepared she is to follow in her mother's footsteps and assume the mantle of Wonder Woman, and suddenly her quest to become a hero becomes one to discover who she really is. While the book had a bit of a slow start for me, once I really got into it, it was a great read. It's the story of a mother's love for her child and of a child coming into their own. Elissa's struggles, while set in the realm of being a superhero, are ones that most of us can relate to and remember going through. Some of us are still struggling to discover ourselves. As for her mom, I can relate as I watch my own boys grow up and have to step back sometimes and let them discover things for themselves. Unfortunately, I have some bad news for all of you out there. While I would highly recommend this book to anyone who loves super heroes, has children, knows people who have children, etc, this book appears to be out of print. Amazon has 2 copies being sold in their used section. I also couldn't find a website for the author. There is an email address in the front cover of the book so hopefully when I contact him, I can get some more information. If I do, I promise to report back!